The View - Panes - Project pane lists all components in the project and provides the primary interface for organizing and using components. By default, the Project pane appears with the Contents pane in a tab strip to the right of the Manifold desktop. If the Contents pane is in the foreground, click on the Project pane tab to bring the Project pane forward. 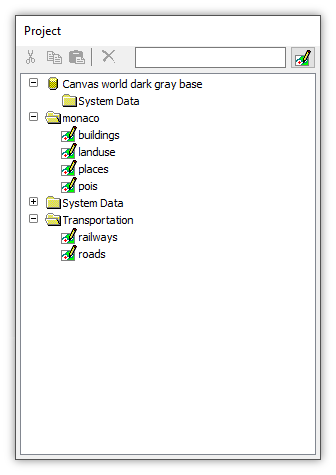 The Project pane can be switched off and on from the main menu by using View - Panes - Project. Alt-click the Project pane's tab to undock the Project pane. Alt-click the title bar to dock it again. 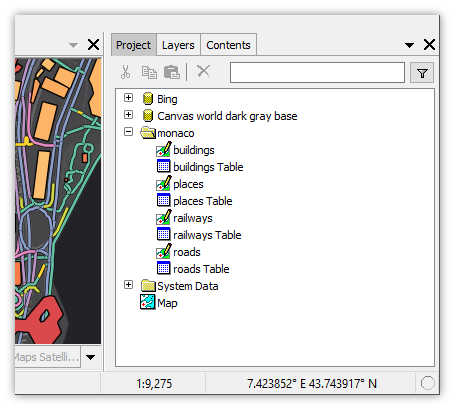 An undocked project pane can be resized and moved anywhere on our Windows desktop. 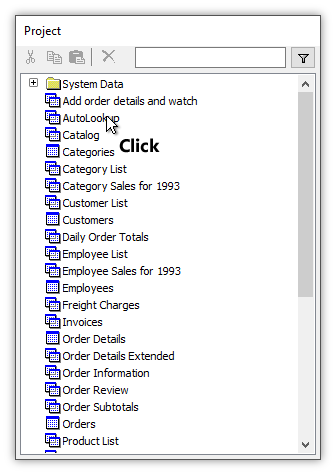 See the User Interface Basics topic. The toolbar at the top provides the usual Windows Cut, Copy, Paste and Delete commands, which are enabled when we click or Ctrl-click a component to highlight it. With the focus on the Project pane, keyboarding the first few letters of a desired component will highlight that component. For example, with the AutoLookup query selected as seen above, if we keyboard the letters cus the highlighting will jump to the first component beginning with those letters, the Customer List query. Projects can have hundreds of components, so it helps to be able to keep the project pane organized (use folders) and to filter what the project pane shows. A filter box allows us to enter text by which to filter the contents of the pane so we can more easily find components when projects are very large. 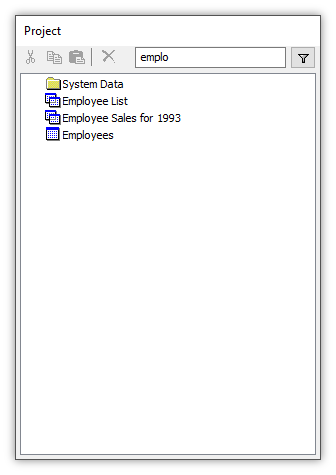 The Project pane will show only those components that have in their names the text entered (case not significant) into the filter box, as illustrated above using the text emplo to show components that have Employee in their name. A Filter button to the right specifies what types of components are displayed and how they are sorted for display, by Name or by Type. 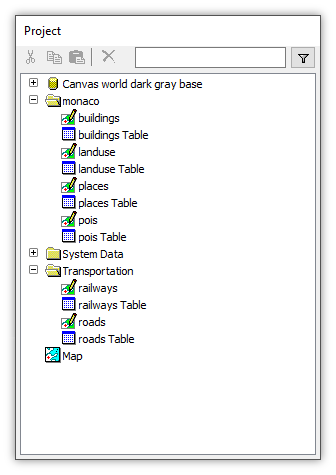 By default the Project pane displays components sorted alphabetically by their name. 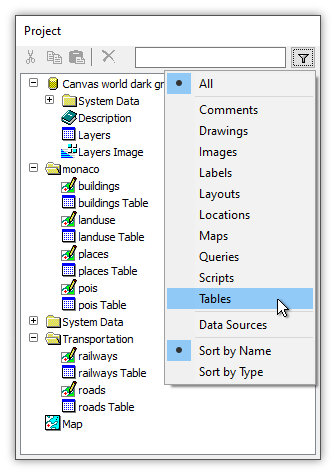 We can choose to show only one type of component, for example, choosing the Tables option to show only tables. The Filter button will display the icon for whatever component type has been chosen to alert us the Project pane is showing a filtered view. We can create a new component by right-clicking into white space in the Project pane and choosing the component desired from the resulting context menu. 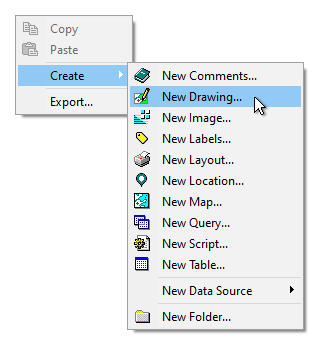 We can also launch the creation menu from the main menu by choosing File - Create. 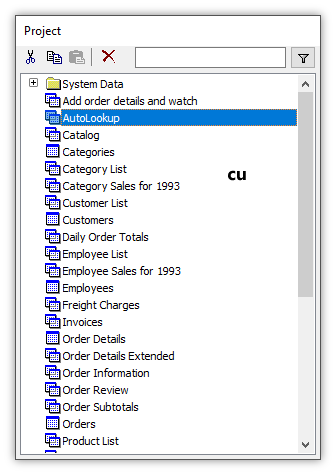 The context menu will have choices on it depending on which component was right-clicked, for example, adding a ! Run command if a query or script is right-clicked. 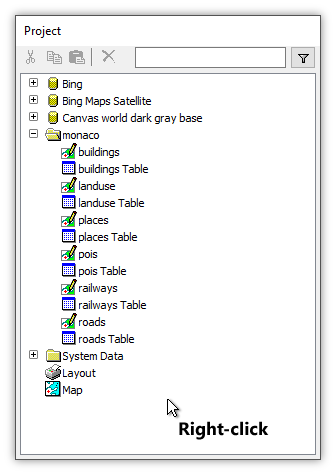 The Project pane uses classic Windows moves to manipulate components. For example, we can click on a component to highlight it and then press the Copy icon to copy it. Pressing the Paste icon then pastes a copy of the component into the Project pane. If we have two Manifold sessions open Copy and Paste work between them. 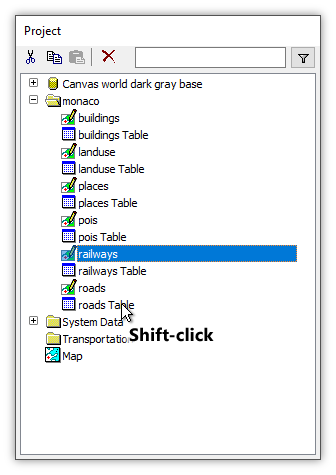 The usual Windows moves work as expected: Ctrl-click to toggle whether a component has been highlighted, so by Ctrl-clicking on several different components we can highlight them each. Ctrl-click to highlight a component and then a Shift-click on another component will highlight all components in between. 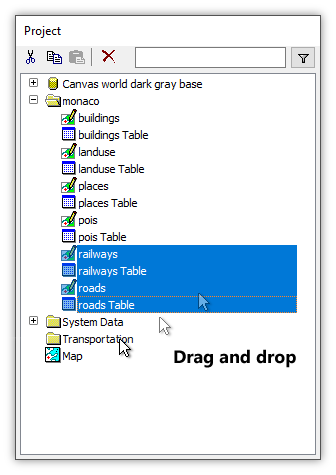 We can move components, for example, into a folder, by using Cut and then Pasting the components into the folder, or we can use drag and drop. For example, if we want to move several components we can click on the first one to highlight it and then Shift-click on the last and all the components in between will be highlighted as well. 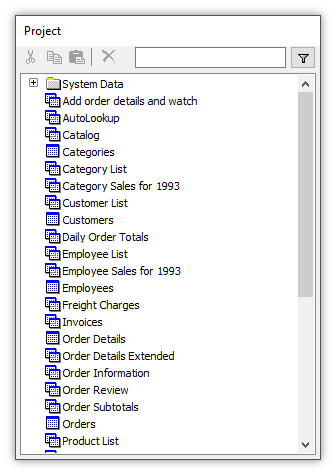 We can then drag and drop the highlighted components into a folder. Folders are a great way to keep a large project organized. We can click on the + icon box by a folder to open it and to see what is inside. To rename a component we slowly double-click it to open it for editing. We can then change the name as desired. Press Enter to accept the edits. Press Esc to abandon the edits. 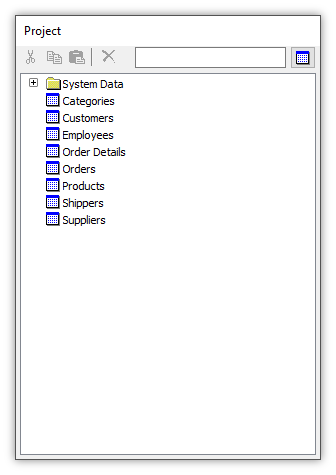 The Filter button specifies what type of components are displayed and the sort order used. 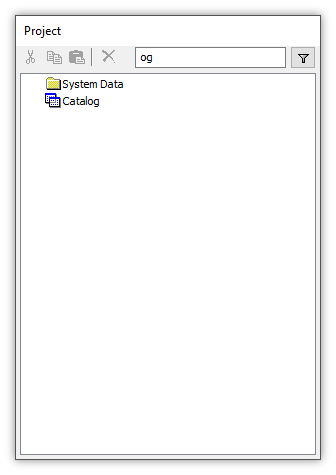 By default all types of components are displayed. 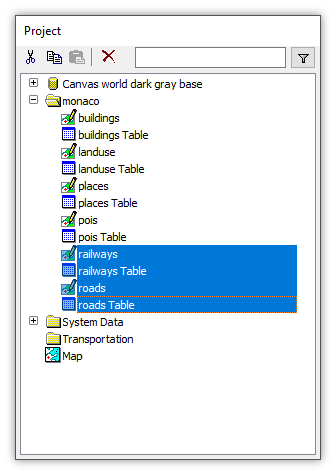 If we use the Filter button to choose Tables then only tables will be displayed. If we use the Filter button to choose Images then only images will be displayed. Changing the setting of the Filter button will not open up folders. It simply changes the display of whatever folders are already open. 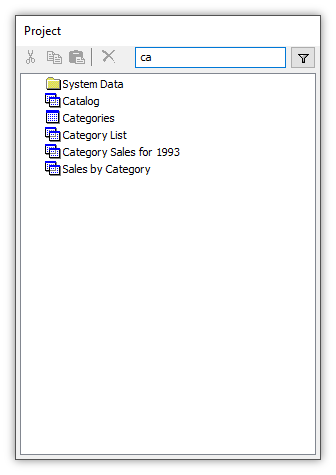 When any text is entered into the filter box only those components which contain the text will be displayed. Case is not significant. 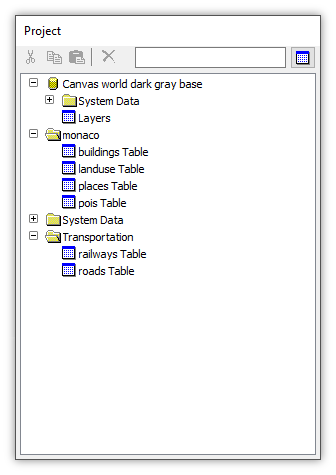 We start with a project containing tables and queries. The moment we enter a c character in the box only those components which contain a c character anywhere in their name will be displayed. As we continue by adding an a character only those components which contain the two-character sequence ca anywhere in their names will be displayed. All that matters is that the sequence exists in the name of the component and not whether it is in the beginning, middle or end of the name. For example, entering the two-character sequence og will cause only the component named Catalog to appear. When we add a data source to a project we create, in effect, a portal to a different world. When we open the data source to show the hierarchy within, the Project pane is giving us a view into the different world of that data source, where the rules that apply are the rules of that world. For example, if we create a read-only data source, then we can open the hierarchy within that data source and view what is in it, but we cannot add components within that world and we cannot change components within that world. 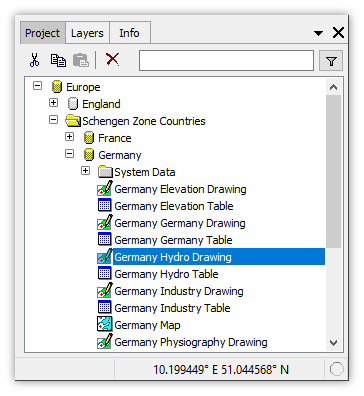 Consider the above illustration, a section of a screenshot shown in the Example: Create a Drawing from Read-Only Geocoded CSV File topic. 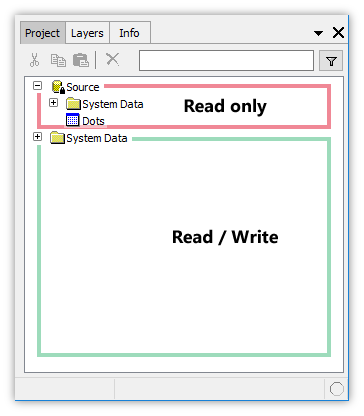 The portion of the hierarchy shown within the read-only data source is read-only. 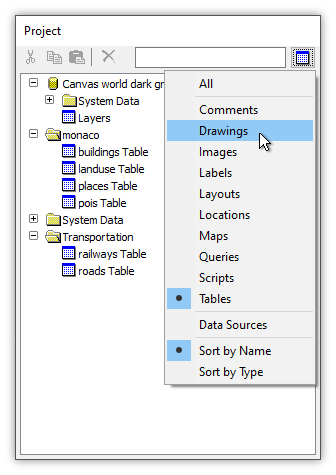 We cannot create any new components in that portion of the Project pane because that portion resides in the different world of a read-only data source that links in a read-only .csv file. We can open the Dots table and read data from it and the table can participate in queries by providing data, but we cannot change anything in that table. 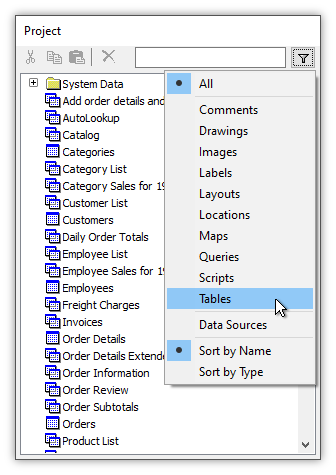 For example, we cannot change the schema of the table by adding fields or indexes to it and we cannot edit values within records in that table. However, if the world of, say, the Germany data source was that of a database such as SQL Server or PostgreSQL, then whatever rules which such databases apply within their own projects, for example, what data types are available, would apply within that hierarchy. Deletions are Confirmed - Deleting components in the Project pane displays a confirmation dialog. The default button in the confirmation dialog is set to Cancel. If we do not want to see the confirmation dialog, we can check the Never show this again box. Another way to eliminate the confirmation dialog is to uncheck the Confirm deleting components box in the Tools - Options dialog.